This month's book is A Killer Stitch by Maggie Sefton. It took me a bit to get into this one. It was a lotta talk at first of knitting and coffee. Once we had a mystery on our hands, it definitely picked up. This is a cute read and it was chosen cause everyone knows I love to knit! 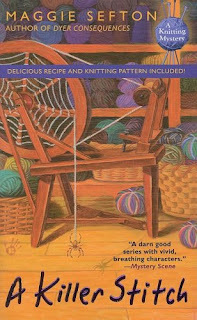 This book comes with a cable scarf pattern as well as a fudge recipe! I'm gonna try and make the scarf, but not til after I finish this book. UPDATE: Well, I finished it... I did! And... it was ok... Out of the four of us, only two of us read it! We (two) both agreed that it just had no 'umph'... No kick! No mystery! I will say, though... I was surprised at who 'did it' but only because I forgot they were even a character! There were way toooooo many characters in this story. And I'm not quite sure why. Oh well... It was an easy read. And I did start the pattern just to see what it would be like. Much like the story, the pattern doesn't have much 'umph' either. A cable on each side of the edge. It would make a cute basic scarf.